What is the purpose of the high rollerstool? The high rollerstool is a versatile workhorse that allows for quick and convenient height adjustment, even while in motion from one location in the shop to another. Built of high-impact plastic with a solid polyurethane seat, this rollerstool can take a beating. The coasters roll smoothly and swivel, allowing effortless direction changes. Two of the coasters lock for added positional stability during extended work periods. This chair combines mobility with safety and stability, making it perfect for delicate operations by workmen and technicians in shops and factories. The storage tray at the base has segmented compartments, allowing easy storage and quick, accurate retrieval of parts and tools. 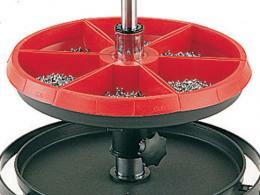 There is even an un-compartmented storage tray at the bottom for heavier tools and parts like hammers or power tools. 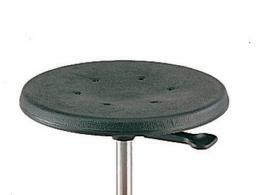 This backless stool can easily be stored under the workbench and pulled out by sticking a toe under the base plate. Easy height adjustment with the lever located conveniently just under the seat. 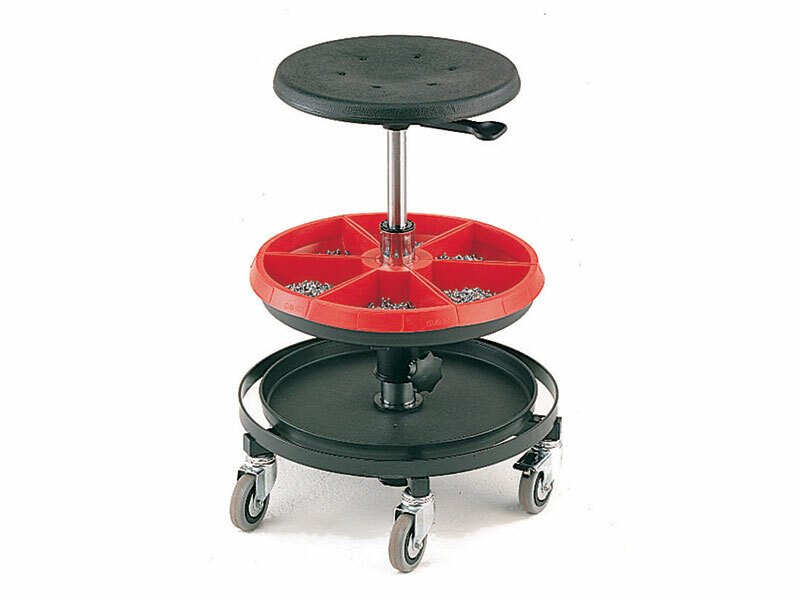 This rollerstool is a natural for workshops, repair facilities, assembly rooms, garages, hospital and research laboratories, telephone locations that require desk work along with customer service, medical and dental consulting rooms, audiologists labs and consulting rooms and practically any other technical or fabrication facility. Electronics components assemblers, jewellers, engravers, watch repairmen, auto mechanics, auto parts store counter staff, consulting engineers, architects working on-site, draftsmen and others. 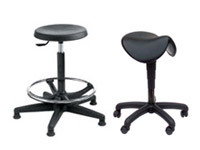 This stool is backed by a standard 1 year parts & labour warranty. The Workplace Depot offers its Price Promise – we will beat any competing price on the same item.